The Isle of Man Senior TT race is the most dangerous and most deadly race in the world. This year a total of three riders lost their lives competing for the top spot. Isle of Man TT is unlike any other race – there are no run offs, no safe environment of a track, just men with an iron clad will riding extremely fast motorcycles doing speeds of over 190 mph on a closed public road. The Ballagarey corner, situated between the third and fourth milestone of the Snaefell mountain course is nicknamed ‘Ballascary’ and James ‘Dynamite’ Hillier found out why during this year’s Senior TT race. Riders often enter this corner at massive speeds of about 150 mph. The Balla-scary is a tight bend surrounded by dry stone walls, traffic lights and a telegraph pole, that leaves very little room for error. This is perhaps one of the reasons besides big speed that makes this race so on-the-edge dangerous. Hillier too was doing over 150 mph while exiting the corner when he start to lose control on his bike. Really struggling against the bike’s power, Hillier finally touches the front wheel back down on the tarmac – under control. After scaring himself and the onlookers to death, he manages to stay onboard and carry on like nothing had happened. 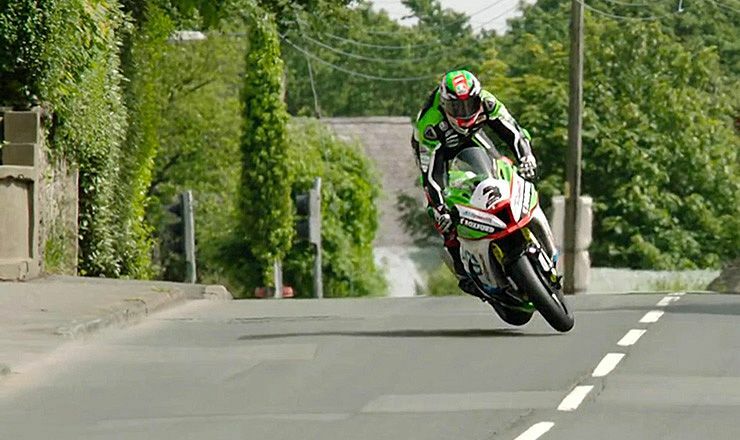 Hillier might call himself lucky, but after all, the fact here is that TT riders are the best in the world. The incident certainly did not affect his confidence, he actually went on to finish fourth in that race. You can watch this miracle save in the video below.